1. 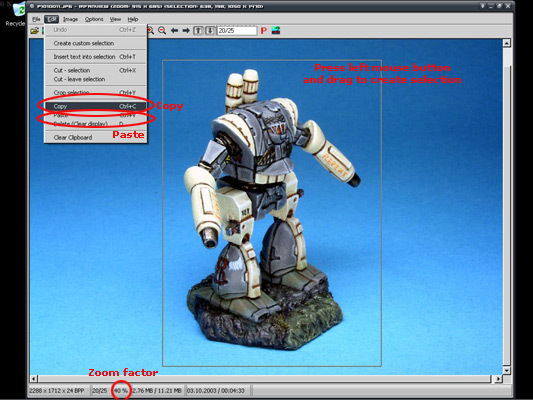 Open the picture with Irfanview, then use the mouse to make a selection of the miniature (simply press the mouse button and drag a rectangle around the part you want to select, see screenshot below). If your picture is too big to see the whole miniature zoom out a bit. The current zoom factor is displayed at the bottom. Personally I prefer pictures where just the miniature is shown since this is what the picture is all about. 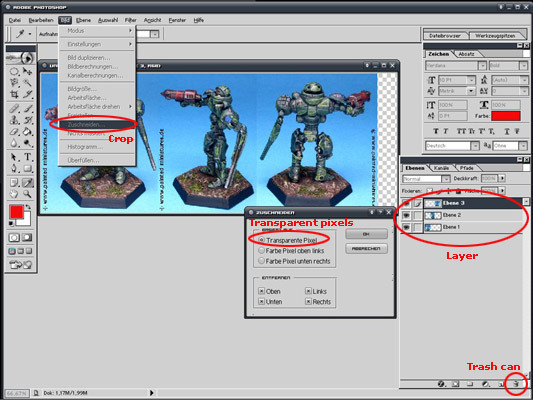 Also you can create smaller pictures sizewise by eliminating unnecessary background. 2. Select Edit->Copy or just press ctrl+c to copy the selection to the clipboard. 3. Select Image->Create new (empty) image to create a blank image. Just click OK in the pop up dialogue (alternatively you can open a new instance of Irfanview without a picture to display). 4. Select Edit->Paste or press ctrl+v and the selection will be copied into the blank picture. 5. Now that we have only the miniature it is time for the actual resizing. Select Image->Resize/Resample or press ctrl+r. In the pop up dialogue enter the new height of the picture. Make sure that 'preserve aspect ratio' is checked, otherwise your picture will be distorted. The new height will then automatically be recalculated. Press OK and your picture is ready. Select File->Save As and save as .jpg. The default settings for compression are ok and usable. IMPORTANT: When resizing pictures make sure to never enlarge them. Enlarging pictures makes them blurry. Reducing pictures in size is never a problem since no sharpness is lost but do not enlarge or risk loosing sharpness. I hope this is will be understandable since I have the german language version of the programm so my english designations for tools and menu items may not be 100% accurate. 1. 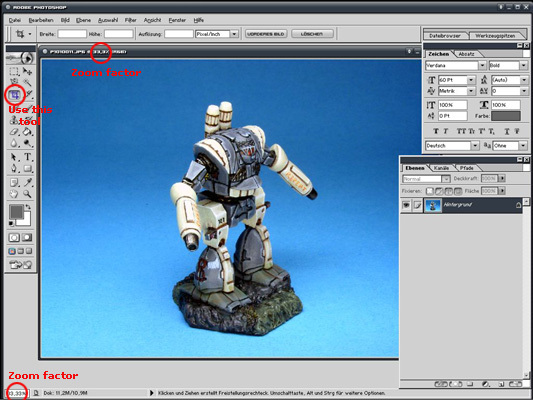 Open the picture with Photoshop, then use the tool I marked in the first screenshot below (I *think* it is the crop tool) to make a selection of the miniature (simply press the mouse button and drag a rectangle around the part you want to select) and press Enter. If your picture is too big to see the whole miniature zoom out a bit. The current zoom factor is displayed at the bottom or in the titel bar next to the picture name. 2. Now that you only have the selction left you made in the previous step it tis time for the actual resizing. 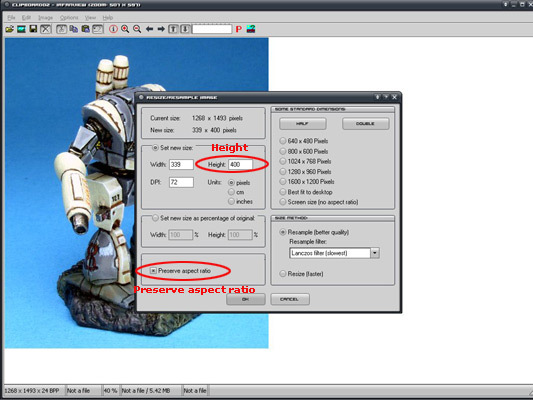 Select Image->Image size and enter the desired height in the appropriate field in the pop up dialog. Make sure that 'keep proportions' is checked. The new height will then automatically be recalculated. Press OK and your picture is ready. Select File->Save for web and save as .jpg. The settings here are more advance than what Irfanview has to offer but to keep it short, setting the quality somewhere between 70% to 80% should be good (check the image size and make sure to keep it below 100k if you want to submit it to CMON). 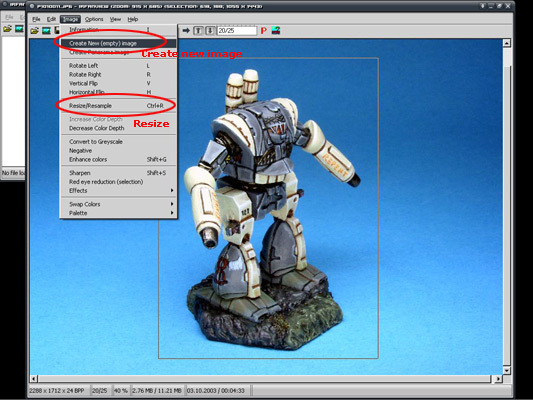 In order to do this you first have to prepare the different views of your miniature like shown above (create selection and resize). 1. Open Irfanview and select Image->Create Panorama view. In the pop up dialog you only have to select the images you want in the Panorama view with the 'Add Image' function. You can create both horizontal and vertical panoramas but with an eye towards size restrictions on CMON (no more than 600px wide) I would recommend horizontal for two different views but vertical for more. Now just click create and your image is ready. Again chose File->Save as and save as .jpg. 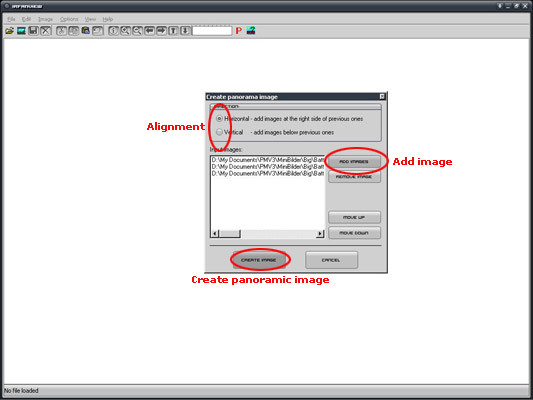 Again you need to have all views you want to use in the panorama ready (create selection and resize as shown above). 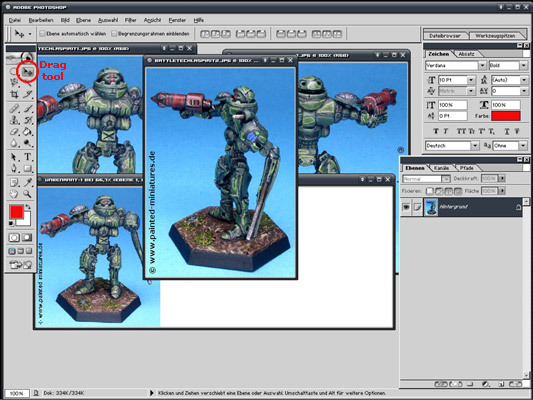 With Photoshop creating panorama views is a bit more complex but also far more advanced and powerful and easier if you want to create panoramic images extending both horizontal and vertical or having thumbnails or detail views included. 1. Open all images you want to use in Photoshop. Select File->New to create a new image. 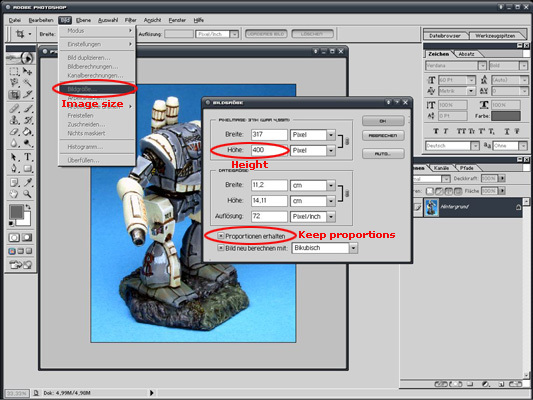 Enter height and width if you know the exact dimension your image is going to have otherwise select big values, you can trim the image easily later. Also select 'transparent' as content for the new picture. 2. Use the tool I marked in the screenshot below to drag the individual images into the new image you created in the step before. With this arrow tool you can move the images around (just press the mouse button and drag). Repeat this until all individual images have been added to the new one. Photoshop uses layers, so each image is in a seperate layer. Layers are hierarchical. If you want to change positioning make sure to first select the layer you want to move. With the help of the layer structure you can have the pictures overlap each other to a small extend to reduce the overall width or height or to place detail views 'inside' another view (layers will be hidden by layers above them ... hope you get my meaning on times like these I curse my lousy english ). NOTE: If you did not chose transparent for content in step 1 when creating the new image you have to delete the layer titled 'background' before using Image->Crop. Simply drag the layer on the trash can (see screenshot below). Now I hope you find some of this stuff helpfull. With Irfanview you have a very easy to use and for a viewer very powerful tool to resize your images for web presentation and it is free so anybody can use it. Photoshop is (of course) even more powerful but also more difficult to use and very expensive. For basic resizing and creation of panoramic views Irfanview is more than enough so use it (I never again want to hear excuses like 'I have only MS Paint and can not resize/crop my pics' ).